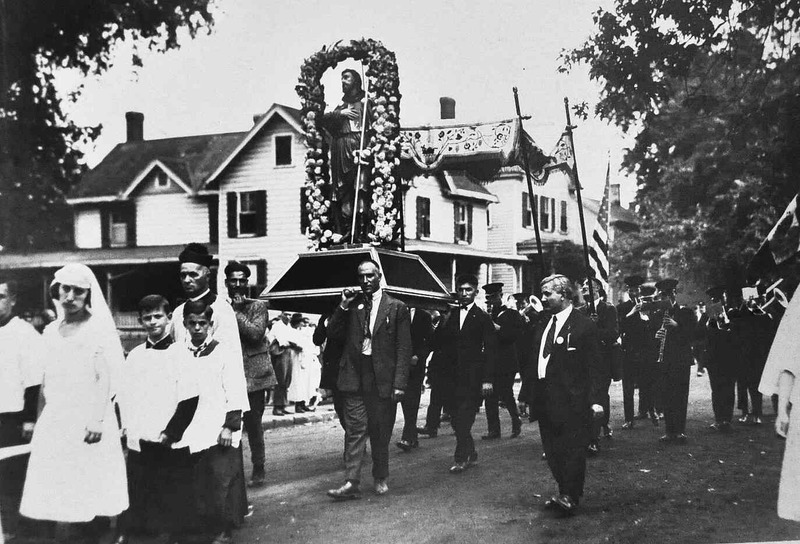 Each summer in Raritan the statue of St. Rocco is paraded through the streets as part of an annual tradition. This celebration honoring St. Rocco – a Saint who had healing powers - was a long established tradition in Italy that was held in mid-August. The Italians of Italy began immigrating to this country in large numbers in 1880. They moved to towns where other Italians had already settled. One of their chosen towns was Raritan which by 1896 had around 100 Italian families in a town of 3000 people. The Italians, then members of St. Bernard’s Catholic Church, decided that it was time to celebrate St. Rocco in their new country. So in 1896 they planned Raritan’s first St. Rocco celebration. This very first festival had all the events that would be the hallmark of future Raritan St. Rocco festivals. 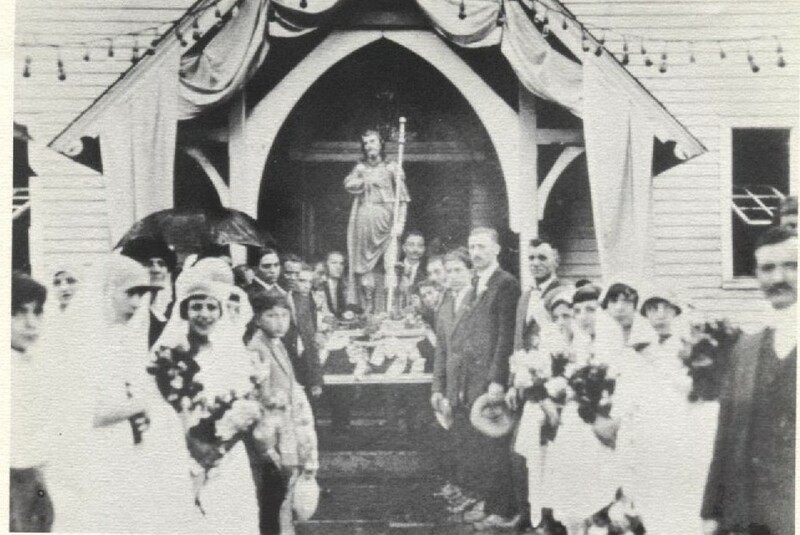 There was a mass at the Catholic Church – then St. Bernard’s, the statue of St. Rocco was paraded through the streets, a country fair atmosphere was setup, streets were illuminated with colored lights, a band would come to town to play, and a grand fireworks display was held. The festival surprised and delighted the non-Italians of Raritan. The newspaper explained it best printing “it appeared to our (Raritan) citizens to be a day of jubilee rather than a Holy Day from all the noise that was made”. But nobody was complaining – it was a lot of fun for everyone. The music, parade, and fireworks were for all to enjoy, not just the Italians. It was era where people seldom heard music (there were no radios or phonographs), so a brass band coming to town to play was a big deal. The bands that were brought into town were top-notch bands from places such as Newark, New York City, and Paterson. The bands would stay in Raritan overnight for the two or three day festival. The band members even attended church with the Raritan people. The band played in a variety of settings. First, they played as they marched through the streets. Second, they played in front of the homes of some of the prominent people. Finally, the band held a well-attended concert in the evening. By the third year (1898) of the festival the trolley line that had started in the east had been completed into Raritan. This allowed thousands to come to Raritan from Bound Brook, Dunellen and East Brunswick as word had gotten around this was something not to be missed. In the first decades the concert and fireworks were held on what was known in Raritan as “the commons”. That was the area behind today’s Municipal Building where the First Growth Plaza (Old Intermediate School) is today. A grandstand and bandstand would be setup for the occasion. 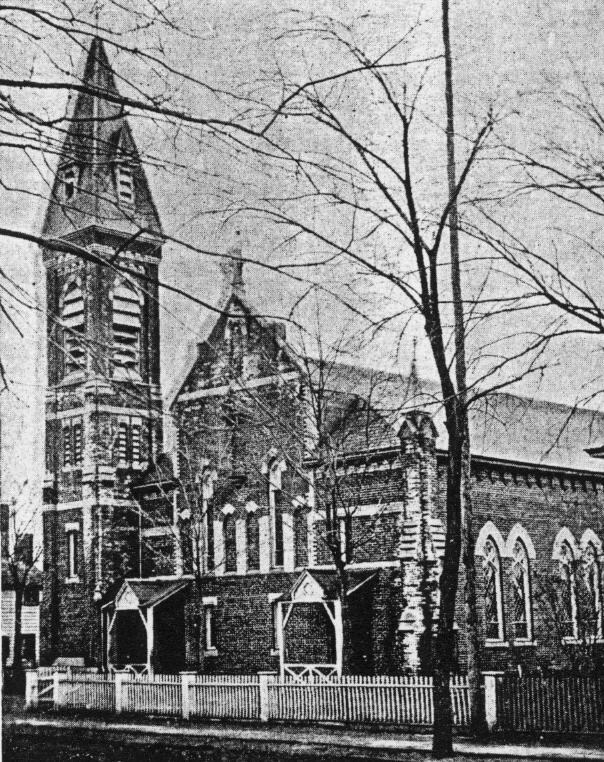 By 1903, the Raritan Italians who had been attending St. Bernard’s Church, started their own church - St. Ann’s. 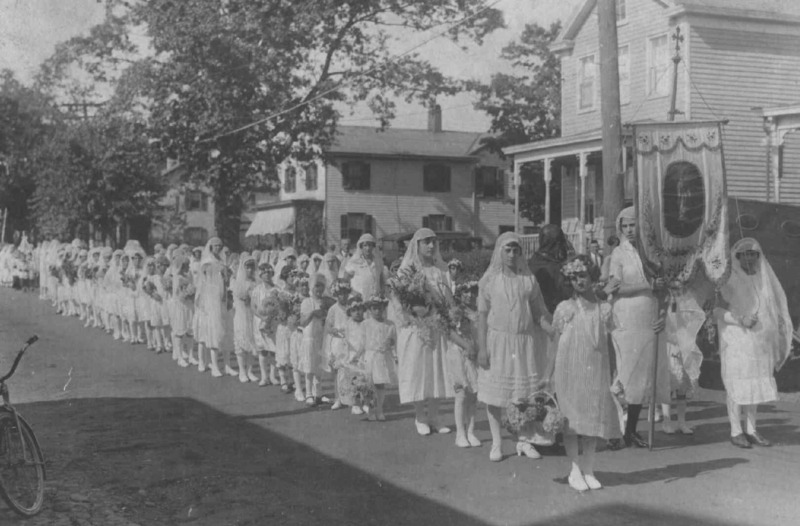 Thus the St. Rocco celebration, after being part of St. Bernard’s for seven years, became part of St. Ann’s – and it has been associated with St. Ann’s Church ever since. Each year the celebration grew in size and extravagance. In 1901 the newspaper estimated that 4,000 were on hand for the fireworks. By 1910, it was 8,000. By 1935 the crowd was estimated at 20,000. Each year more and more people watched the statue procession and more and more people were in the procession itself. One photogenic part of the procession was the young girls who wore white dresses. Many old photos of them have survived. The Raritan organizers strived to make the entertainment the best it could be. For example, two or three fireworks companies would be hired. To motivate these companies to go all out Raritan awarded a $100 prize to the company that put on the best show. One historical note – from (around) 1904-1929 the celebration honored both St. Rocco and another Italian Saint – St. Donato. But St. Rocco received the top billing. The newspaper writers who covered the event always wrote how impressed they were that everything ran so smoothly. These Italians knew how to throw a party. they included Andrea Sibilia, Luigi Minetti, Salvatore Basilone, Rocco Stabile, and Fortunato Corona. But any large event could have an occasional glitch. By 1914 the event had become so large and carefree that it attracted a criminal group of the era – “pick pockets” who managed to score a few wallets that year. So the next year, in 1915, the authorities were on the alert. Not long after the festival began several suspected out-of-town deviants were put in the town jail where they could do no harm. By 1925 the booths, concert, and fireworks would move over to a large field where Weiss Terrace and Meehan Avenue are today. It was farm land owned by Billy Green – thus it was called Green’s Field. In 1942, with the U.S. fighting World War II, the festival changed its tone that year to be that of a patriotic event. In 1943, 1944 and 1945 the event was not held due to the war. 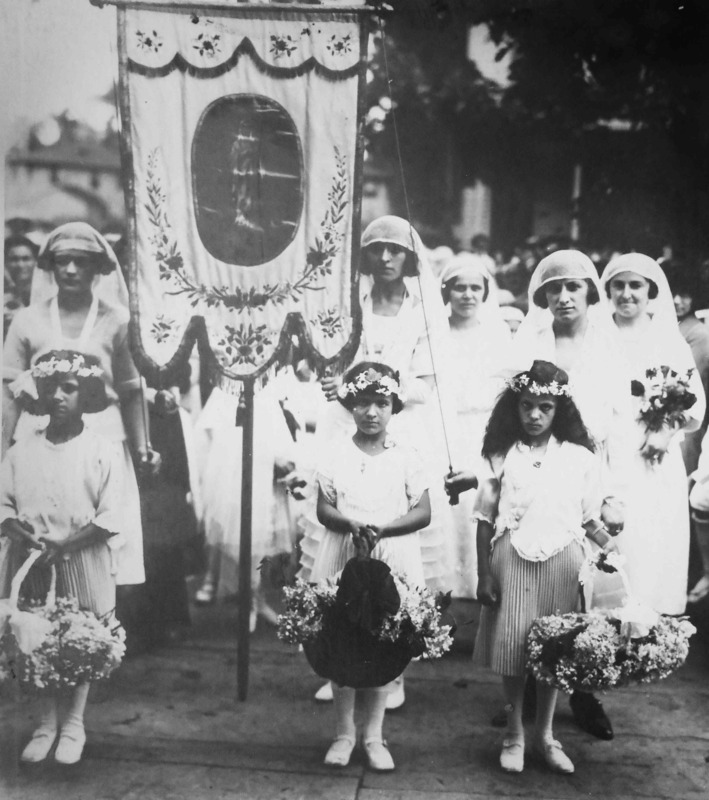 After the war the St. Rocco celebration was once again held with the large crowds returning. It would take place in Green’s Field for a few more years. 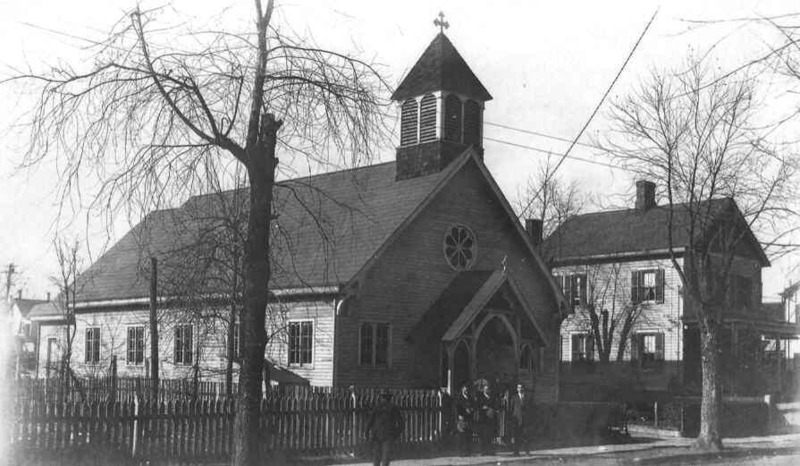 Then by 1950 it was moved over to the property around St. Ann’s Church where it remains to this day. 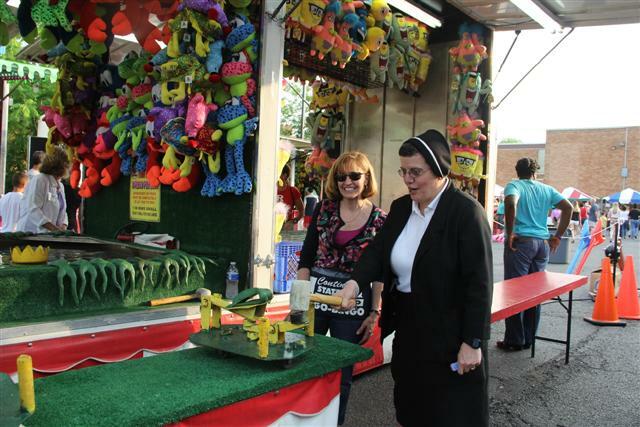 It is no longer called the St. Rocco Festival, but St. Ann’s Festa. It is also now held in June as opposed to the once traditional August. 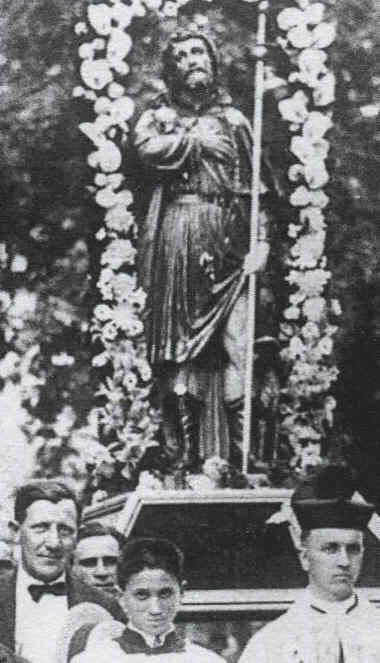 This year, as always, the statue of St. Rocco, which is said to be the original statue used at Raritan’s first St. Rocco festival, is paraded through the streets. But today’s parade route is short and the crowd is just a tiny fraction of what it was a hundred years ago.